-Tell us a little about yourself from the writer to the actor, which do you find to be more rewarding? Todd Farmer: I was the kid telling ghost stories around the campfire. I was the storyteller. And the liar. Because sometimes life would need a rewrite and I was just the guy. This less than stellar trait also made me a decent to okay actor. The great thing about writing is that it's a wonderful way to vent creativity. While I did act in college, writing was and still is my true passion. Acting in the movies started out as a fluke. Just a gag. Look, pop, I'm on the big screen! But a funny thing happened. I noticed how the writing and acting really did compliment each other. Acting was making me realizing things about character... it made me a better writer. And writing had given me such a unique point of view into the mind of the character that my acting was better. As an actor you can touch relate and touch people's lives with your performance. As a writer you provide the actor with the blueprints to touch lives but writing is so very therapeutic that you inevitably touch your own life and many times heal it. -Were you happy with the outcome of the "Days of the Dead" convention, is there anyone you were happy to meet of a celebrity nature? Todd Farmer: Days was my first official convention where I had a table and meet fellow horror lovers like myself. I had a blast. I made new friends and I danced. You can't beat that. Early on I spoke with Bill Moseley and he's such a lovely man. Have gave me some invaluable dos and don't s. Later I spent time with Sid Haig and it's so very clear why these men are icons in the industry. Truly wonderful human beings. Charismatic and simply fun to be around. And I had the pleasure of befriending Joe Knetter and Sarah French and I got them, can see a long friendship with these two... if they'll have me, of course. Every year I really am drawn to those who love horror. They are not as the media would have you believe. They are kind and decent and respectful. Way more-so than those bloody romcom fans. Horror lovers understand there is no good without evil, no light without dark. And it is in that understanding that I have found my comrades. -Being the point of view of the writer, your work has made it possible to work around some iconic actors/actresses... How much involvement do you have in the actual filming and working around these people... do you find yourself in any "awe" moments? Todd Farmer: Normally the writer would have zero interaction with actors. We come in early and we leave first. By the time the actors come on stage the writers are normally long forgotten. So the fact that I've partnered with Patrick Lussier makes me that much more blessed in my career. Patrick has always kept in the loop. Asked my opinion and I've always put his vision first. It's been a wonderful partnership and I'm blessed to have it. My first movie I worked with Kane Hodder and of course I was star struck! But what a wonderful man. A complete professional. I would have broken my lovely nose on that production but Kane, a stuntman first, saved my pretty face. Jensen, Kerr, Jaime, Edi, Kevin and Tom Atkins! The entire cast of MBV was a thrill to work with. And then comes Drive Angry. One word. Fichtner. I got to act with Bill Fichtner. That will always be a high point. Amber Heard. Patrick and I wrote this spunky female lead and Amber walked in and took command of it. And not only is there that, but I can proudly call both she and Fichtner friends now. And finally there's Cage. The man was a rock star. He knew every line, nailed every delivery. He's a one-take actor. Patrick says action and Nick nails it. So yeah, I've been blessed and star-struck. I love my job! -Can you tell us your involvement in upcoming projects "Heavenly Sword" and "The Monkey's Paw"? Todd Farmer: I wrote a screen adaptation for the video game Heavenly Sword a couple years ago. Animation takes some time but I've been told it's almost done! I get to screen it in a week or two. Then in April, if all goes as planned, I'm taking it with me to the Gold Coast Film Festival in Australia where I'll screen it with a live audience. I loved playing the game so writing a story for it was so much fun. While I spend most of my time in horror I'm secretly a huge action and fantasy fan so it was a fantastic experience. Monkey's Paw falls on the opposite end of the spectrum. It's the darkest, most disturbing story I've ever written. Based on the short story we have a fantastic director and one he's wrapped the remake of The Crow then I'm told we're moving into production. Of course, I should make some calls to see if that's still the plan! 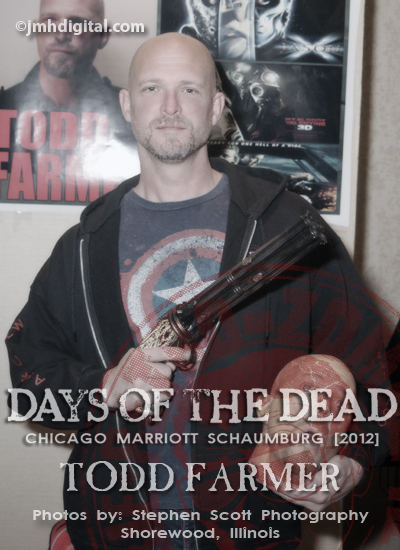 Todd Farmer: Where to begin... First there was Freddy Vs. Jason. It had been in development for years when I arrived on the scene and it was two years later before we started talking a stand-alone Jason film. We talked about picking up after JGTH but the challenge was Freddy VS. Jason. We had zero idea where they would end up going with their story and we didn't want to do anything that would screw up the chronological order of events. THEN there was the very real concern that Mike DeLuca (now a good friend, he produced Drive Angry as well) did not want to make another Crystal Lake movie. I suggested setting the story in the future in a Blade Runner society. It wasn't long before that was deemed too expensive so I suggested Aliens. Let's set it in space. And that's how it happened. Dallas was my first acting fluke. Or goof. I was asked if I wanted to play a part. I said yeah. They asked which part? I suggested Dallas since his part was one of the meatier of the grunts. And that was day one of shooting. I was the very first character shot. Still pretty cool when I think back on it. -If your life was a song title, what would that be and why? Todd Farmer: Wrong by Depeche Mode. The lyrics will make that very clear. JASON X is the best in my humble opinion. Great interview. Seems like a really cool guy. Working with William Fichtner would've been a great experience. La-La Land Records: Battlestar Galactica News!